Did Mossad Murder Hilda Murrall? 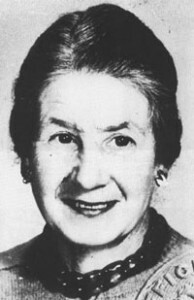 Browse: Home / Did Mossad Murder Hilda Murrall? Nuclear power is an inherently dangerous source of energy, as events at Fukushima recently revealed. So it goes without saying that nuclear weapons are all the more so. Israel’s arsenal has been substantially enlarged since Mordechia Vannunu first heroically blew the whistle on it. Nonetheless a Sunday Times article that appeared in the wake of Vannunu’s disclosures featured interviews with several Nuclear Authority policemen about the threat posed by Israel’s nuclear arsenal. Significantly the interviews were omitted and have since been kept under wraps: because what they discussed was considered more inflammatory than Vannunu’s disclosures. More than revealing concerns about Israel’s nuclear arsenal suspicions were voiced over the deaths of two prominent anti-nuclear activists. In April 1985 a Scottish Nationalist SNP activist and lawyer William Mcrae who was vehemently opposed to Scotland’s involvement in the nuclear industry was found shot dead in his car in the Scottish highlands. In 2005 a lad called Andrew George who was a 16 year old in foster care with learning difficulties at the time of the killing, was found guilty of Hilda Murrall’s 1984 murder. But as Hilda Murrell’s nephew and former Royal Navy commander, Robert Green writes in his book “A thorn in their side, The Hilda Murrell story” George was obviously not responsible for his aunt’s death. For the British security services have a record of colluding with police to set up naïve and trusting locals, as in the Jill Dando murder, where the killing has all the hallmarks of a professional hit. Significantly however, for the killings to succeed they first have to be sanctioned by senior figures within the British security establishment. The general opinion in informed circles is that the killing was authorised by Sir Colin Figures, the Jewish Chief of MI6 who worked closely with Prime Minister Thatcher’s security advisor Lord Victor Rothschild. And here it’s worth recalling that Rothschild was instrumental during Harold Wilson’s years in office for the secret export of Plutonium to Israel. Rothschild pushed for further British investment in the nuclear industry for his own ends, and he allegedly also helped orchestrate the miner’s strike, which crippled the country and put huge numbers on the dole. Defectors have suggested that the Russians assisted the industrial disruption while the murder of those people opposed to the nuclear industry has Rothschild fingerprints all over it. There are another 6 murders whose names can be found on the Hilda Murrel website, and 4 more unlisted. Hamish Watt a medical man who examined William Mcrae’s body told the Aberdeen Journal that he found two bullet holes in the back of Mcrae’s head, close together and fired from point blank range: a clear indication of an execution style killing. Despite this and the fact that Mcrae’s two brief cases were found some distance down the road together with a pistol that was found later even further away, the official verdict was still that of suicide. Beyond the obvious pointing finger to MI5, who would usually farm the job out, the real killers would appear from other sources to be Mossad. Former MP Tam Dalyell claimed that an MI5 operative told him Hilda Murrell disturbed two men ransacking her house, and although her body was dumped on the Wednesday we are supposed to believe that her body lay there in open land undiscovered until Saturday, despite a search with dogs having started on the Thursday. Russian multi-millionaire and mafia boss Ivan Lukaszewski now resident in Britain, says the KGB has much info on this and that Israelis were behind the mass killings of intellectuals, scientists and educated people from the foundation of the Jewish state up to and including Iraq and now Iran. Not many people doubt now that Princess Diana, Dr. David Kelly, Robin Cook and Christopher Shale were all murdered to silence them. 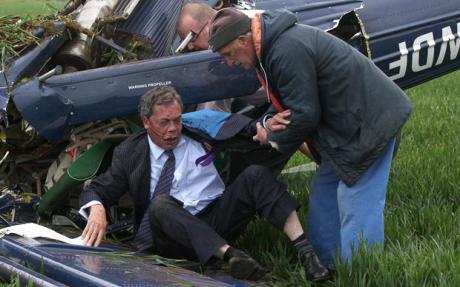 So it’s no coincidence that the popular but outspoken UKIP political leader, Nigel Farage who was challenging Commons speaker John Bercow for his constituency was involved in a plane crash that nearly killed him on election day 2010. The pilot Justin Adams has subsequently been charged by the police for bragging he would kill the UKIP leader. Nigel Farage had made two big mistakes: he upset the powerful Jewish lobby by taking a political seat away from puppet John Bercow and he promised to pull Britain out of the EU. *With thanks to Shrewsbury archives, Aberdeen news reporters, Shropshire meals on wheels, neighbourhood watch papers, Telegraph archives and various others.